Our "Pro" Series of Reciprocal Saw Blades feature a superior bi-metal construction with a cobalt steel edge and spring steel back. As a result, the durable Pro Series delivers the smoothest, cleanest, fastest and most accurate cuts. No matter the surface or cutting application, you're sure the find the blade you need! Bi-metal steel blades with a cobalt matrix high-speed steel edge, which is electron beam welded into a spring steel spine, make these blades both flexible and shatterproof. 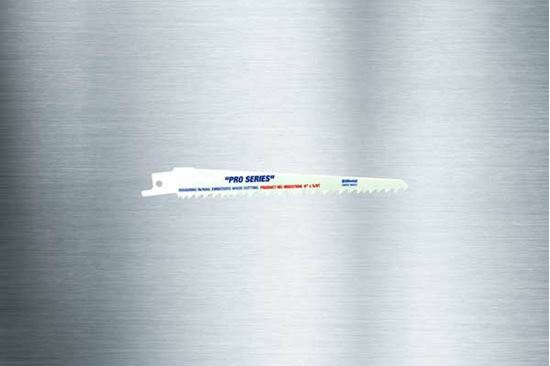 "Pro Series” blades last longer than ordinary M-2 bi-metal reciprocating saw blades. "Pro Series” blades resist tooth stripping, a common problem for inferior quality blades. The blades’ optimized edge hardness allows for cutting harder materials with an extended blade life. Precision ground teeth offer fast cutting and clean finish on a wide range of materials.